After convincing the Acosta to show him the project, and promising to find money to fund the drilling, they go into business together. The first few holes are duds (no gold), the money runs out, and Wells almost dies of malaria. But, lo and behold, when he recovers, Acosta is by his bedside with good news: they’d struck gold! Wells and his team turn on the charm and investors of all sizes hop aboard for the ride. The share price rockets from 30 cents to $250! They are all rich beyond belief for a few months, but sadly, it doesn’t last and all is lost. The money dries up on the news that the samples were spiked with gold to produce fake readings, and Acosta mysteriously disappears out of a helicopter over the Indonesian jungle. Wells is investigated by the FBI: Who spiked the samples? Is Acosta really dead? The film was inspired by a true story. Perhaps you’ve heard of the Bre-X scandal? In the mid-1990’s, a group of small Calgary-based mineral exploration companies (Bre-X Minerals Ltd.) claimed to have discovered an enormous gold deposit at Busang, in Borneo. Their share price on the TSX sky-rocketed but eventually tanked when it was revealed that samples from the site had been ‘salted’ with gold. The science behind this salting scandal is interesting. In the real-life version of events, on-site Bre-X geologist, Michael de Guzman, sprinkled gold – first filed from his wedding ring, and later, tiny gold nuggets panned from the river – into the samples sent to the lab for analysis. Once the samples are crushed and processed through the lab, it is almost impossible to tell the origin of the gold. But, processing labs often keep half the sample aside, in case there is a need to re-analyse. In this case – as the rumor goes! 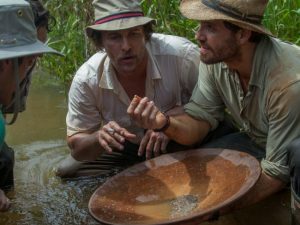 – an independent geologist looked at these samples and identified the gold not as primary gold from the core samples, but secondary alluvial gold. How could they tell the difference? Gold panned from a river has rounded edges from bumping against other rocks and minerals in the water flow. Primary gold – from an ore deposit – would be more angular and ‘fresh’. The evidence was clear through the microscope, and corroborated by news that the geologist had been buying gold nuggets panned from the rivers near the project. 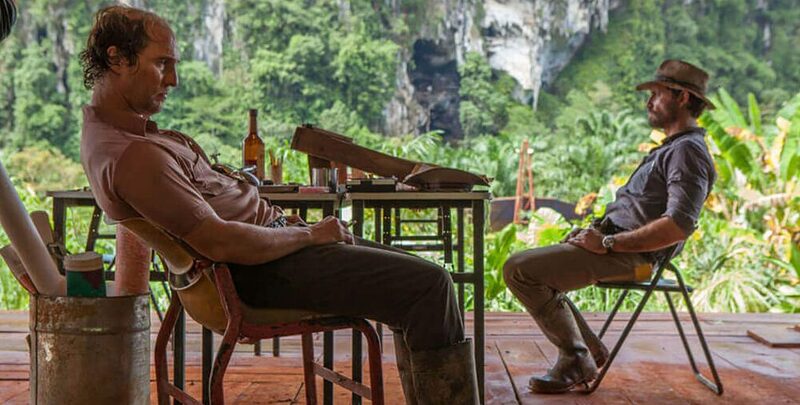 If you can handle watching Matthew McConaughey play a sweaty, sleazy, and awfully sexist character for two hours, this movie is quite a fun ride, and didn’t have to stray too far from the real-life events! 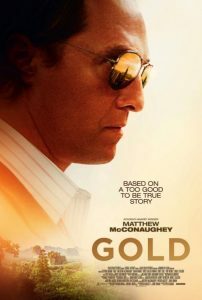 Gold (2016) Directed by Stephen Gaghan, the film stars Matthew McConaughey and Edgar Ramirez and Bryce Dallas Howard. The film is written by Patrick Massett & John Zinman. Teddy Schwarzman and Michael Nozik served as producers alongside Massett, Zinman, and McConaughey. Also, check out this excellent infographic on the real Bre-X scandal from Visual Capitalist.